Sitting in the cool mountain air overlooking the beautiful lush tropical hillsides and valley leading out to the Pacific, this magnificent estate offers complete luxury and privacy. 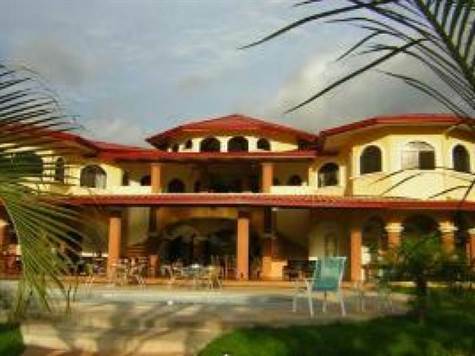 It is rare in Costa Rica to find a property that offers everything this property does. The main house is a 6 bedroom mansion with a huge pool and lots of entertainment space, perfect for large groups wanting to get away from it all. In addition there is a 3 bedroom guest house, caretaker’s quarters that sit on 8 acres. With an additional 54 acres available with 5 incredible picturesque waterfalls and at least 5 other building sites (perfect for turning this property into a gated community). Here are just a few of the things this amazing property offers … Each room is its own suite 12 seat movie theatre Restaurant sized dining and social area Professional kitchen Large entertainment pool Outside gymnasium Large sized garden chess board Gardens and fruit trees all over the property Very high occupancy rate Comes completely furnished and “turnkey” Fully staffed As an investment this is a very good opportunity. The vacation rental estate has a very high occupancy rate, very well located just 20 minutes from the 2nd largest city in Costa Rica and is ideal for large groups to rent or even better a B&B. Contact me with questions or a time you would like to view the property. Thank you and Pura Vida.